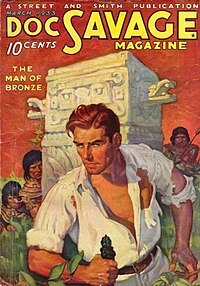 Lester Dent was the real name of the author almost all of the Doc Savage novels. (They appeared under the pen name Kenneth Robeson, a creation of his publisher.) There were 181 of them in total, published between 1933 and 1949. Dent wrote 159 of them. An average of ten a year for 16 years. You can check out Dent’s first Doc Savage, The Man of Bronze, in a variety formats on Faded Page, “an archive of eBooks that are provided completely free to everyone.” Just click here.